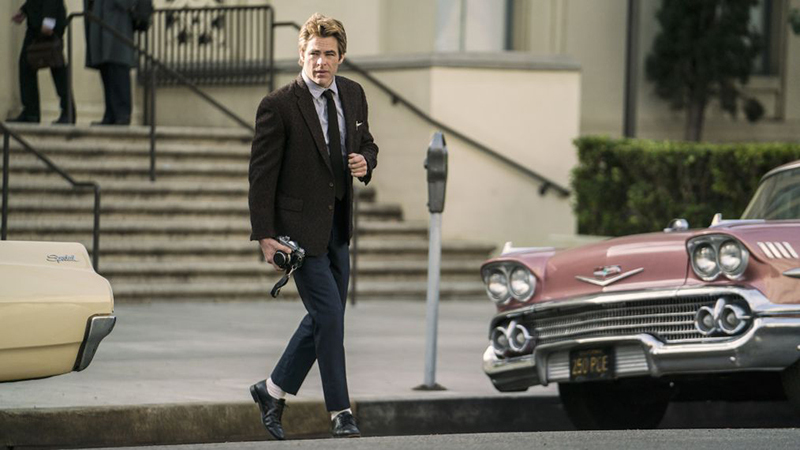 TNT’s I Am the Night is a six-episode limited series from Wonder Woman director Patty Jenkins and star Chris Pine. The story follows Pat, a.k.a. 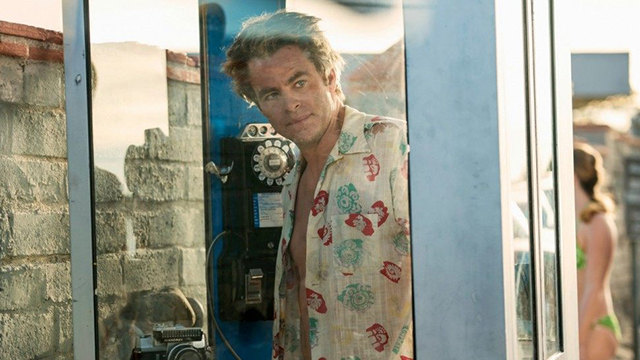 Fauna Hodel (India Eisley), a naive young girl growing up outside of Reno, Nevada who embarks on a quest to discover who she is, and Jay Singletary (Chris Pine) a former Marine turned drug addict and hack reporter who covers a gruesome murder. Set in 1965, we are briefly introduced to Pat and her mother Jimmy Lee, with the former commenting on how she just wants to be normal. 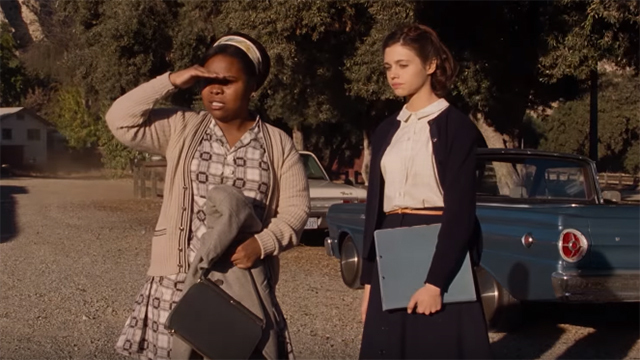 At school, Pat is subjected to a racist classmate who prevents the new girl, Mary Lou, from sitting with Pat because she’s half black and half white with a black mother and friends. Pat works at the Sisters of Mercy Hospital in Sparks, Nevada with another teenager named Lewis Ferguson whom Pat is dating. While walking home, the couple talk about future plans together before getting caught kissing by two officers. The police assume Lewis, who is black, is harassing Pat. The two racist cops let Pat and Lewis go when Pat tells them that she’s mixed race (and not a white girl being attacked). Jay Singletary, a freelance reporter for The Examiner, is caught by a couple who spotted him taking photos of them being intimate on a Los Angeles beach. The woman chases Jay, crying and saying the photos will ruin her. Later, Jay’s guilt gets the best of him and he tries to tell the man paying for the story that his camera was smashed. When the man becomes irate, Jay fesses up that he does have the photos and that he’ll bring them before breaking the phone booth’s telephone. The next day Jay shows up at the press conference by sneaking in as a doctor since he doesn’t have the proper press credentials. In the morgue, Jay takes photos of the mutilated Janice Brewster and is ultimately caught, arrested, and beaten by a Detective Billis. Later, a cop buddy of Jay’s who served with him in the Marines gets the charges dropped. When Jay reveals he had hidden one of his film cartridges in his sock containing the pictures, his friend warns him to steer clear of Billis. At home, Pat tries to tell her mom about a white man in a car that she has seen watching her a few times, but Jimmy Lee changes the subject. That night, Fauna sneaks into her mother’s room and takes a box. Inside, Pat finds a birth certificate and discovers her real name is Fauna Hodel. Her birth mother’s name was Tamar Hodel, listed as white, with an unnamed black father. The next morning, Pat confronts Jimmy Lee about the birth certificate, who eventually admits that Pat really is Fauna Hodel. She explains that Fauna was given to her in a bathroom by a white woman at a casino who asked Jimmy Lee if she would adopt her daughter’s baby — though Jimmy Lee thought the lady was just drunk and agreed only to get more tip money. Fauna’s birth mother, Tamar, was 15 at the time. Later, when Tamar’s mother confronted Jimmy Lee about not keeping her word, Christopher, Jimmy Lee’s former reverend husband who is no longer in the picture, agreed to take Fauna. Jimmy Lee tells Fauna that she did the best she could raising her. She then tells her that Fauna’s “white family” is rich. Her grandfather is a famous doctor in Los Angeles, so Fauna needs to keep her real birth name legal so she can have money one day. At work, Fauna steals her adoption papers and contacts her grandpa, Dr. Hodel. Fauna connects with her grandfather who exchanges pleasantries before telling Fauna that Tamar is not well and not to speak with her. He then invites Fauna to visit him in LA. Right after she hangs up, Fauna is told Jimmy Lee is dead. Fauna races home, only to find Jimmy Lee is, in fact, alive and the whole thing was a cruel lie. Jimmy Lee tells Fauna that she wanted her to feel it “when God tears your heart out” because that’s what she lives with. She talks about Fauna as a baby with her blonde curls and how she had to pretend to be Fauna’s nanny instead of her mother because, for example, a white woman once threatened to call the cops thinking Jimmy Lee had stolen the baby. After a fight, Fauna tells Jimmy Lee that she’s leaving to meet her grandfather in Los Angeles. At the bus stop, Fauna tells Lewis she’ll only be gone for a week, and he asks her why she would come back if she has a rich family in LA. Fauna says that she wants to be with Lewis before saying goodbye. The white man in the car who was spotted watching Fauna follows the bus as it leaves. When the bus later pulls over for a break, a random man starts speaking with Fauna. After a brief talk where Fauna reveals to the stranger that she wants to know where she comes from and who she is, she reboards the Greyhound, leaving the mysterious man behind. Back at his apartment, a struggling Jay ties a belt to his ceiling and appears to be about to hang himself. Suddenly, his phone rings and Jimmy Lee is on the other end asking if he’s the same Jay Singletary that once wrote an article about Dr. George Hill Hodel. The first paragraph of the article she’s holding describes how the doctor, Fauna’s grandfather, was “acquitted of morals charges involving his 14-year-old daughter Tamar.” Jimmy Lee tells Jay that he was right about Dr. Hodel, and that he has to keep looking before hanging up. After arriving in LA, Fauna calls and leaves a message with a woman to tell her grandfather that she is at the downtown Greyhound station. She then calls another number, reaching her step-grandmother who tells Fauna that her grandfather is a dangerous man and to stay away. The episode ends with Dr. Hodel at a party, Jay looking over his article about the acquitted doctor, and Fauna alone in a phone booth. What did you think of the I Am the Night series premiere? Let us know in the comments below! The post I Am the Night Series Premiere Recap appeared first on ComingSoon.net.